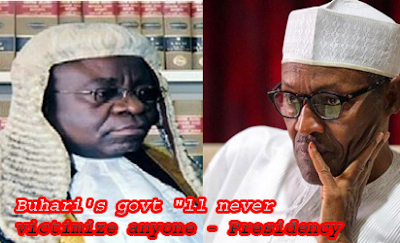 ABUJA—One of the Supreme Court judges, whose home was invaded by the Department of State Services, DSS, penultimate weekend, Justice John Inyang Okoro, has alleged that his travail in the hands of the operatives was in connection with alleged desire of the Presidency and All Progressives Congress, APC, to win at all cost, election appeals in Rivers, Akwa Ibom and Abia states. He also said the $24,000 and £10,000 recovered in his house by the operatives was balance of the estacode he received on foreign trips for three years. This came as indications emerged, last night, that a female judge of the Federal High Court might be arrested for allegedly shunning an invitation to appear before the Economic and Financial Crimes Commission, EFCC, to be questioned on alleged corrupt practices in the discharge of her duties. Also yesterday, one of the embattled Judges, Justice Adeniyi Ademola, said he would no longer preside over the criminal charge the Federal Government preferred against the detained former National Security Adviser, NSA, Col. Sambo Dasuki, retd. Justice Okoro, in a letter written to the Chief Justice of Nigeria and Chairman of National Judicial Council, NJC, Justice Mohammed Mahmoud, dated October 17, 2016, said the recovered money was exclusive of those he received from international conferences attended since he joined the Supreme Court three years ago.